Be part of the action or simply watch it pass by, the beach is with a 1 minute stroll, williamson park is at the end of the street with Blackies cafe and surf club on it and all the festivals and car shows. Town is a 5 minute stroll. A large modern home with large deck facing the surf beach, pizza oven and weber bbq for night time entertaining. Open plan living, kitchen and dining that flow onto decks. Large front lawn for the kids to play on that is fully fenced and room for 3-4 cars on the driveway that has lockable gate. Fantastic location, great house for a holiday - plenty of room. Love the indoor/outdoor flow. Beds are okay. Sometimes there are issues with the indoor showers being slow to drain, but "Draino" seemed to sort it, and one of the showers leaks and needs repairing. But we thoroughly enjoyed our summer holiday here. We also enjoyed last year in the same house. It's nice to have a couple of fridges and freezers, and a well equipped kitchen. Comfortable for relaxing. For our family and in laws this was a brilliant place to stay. Spotless clean, well equiped, brilliant location, great layout. Pizza oven! Great rapid communication with owners. Want to come back if we can. Great place for a family holiday. The property was an excellent find with an easy 1min walk to the beach. My family stayed here for the second time recently and it really is a great house - with a nice front yard and deck, close to the beach (1min walk to check out the surf or watch the sunrise). 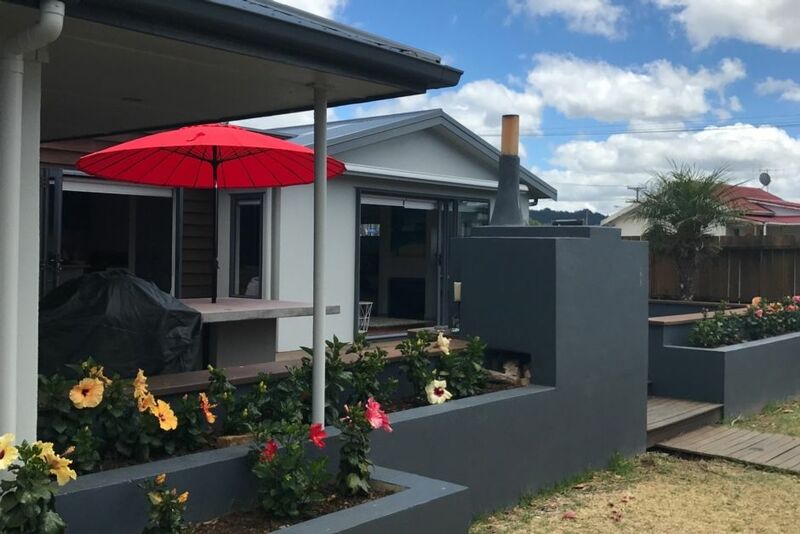 We've been visiting Whangamata as a family since the 1980's, and it's a real pleasure to stay at such a well-located house by the beach and close to town, with great facilities - including Sky and wifi. We hope to be able to come back some time soon.